Interactive entertainment company Ludia Inc. , in collaboration with Sarbakan  and King Features  have announced the launch of ‘Popeye Slots ’ game App for iPhone, iPad and iPod touch. Based on the internationally recognized cartoon character Popeye, one of King Features’ most popular properties, is now available for players across North America, and soon to be worldwide, to revel in an exciting slots game! The classic and widely recognized Popeye, originally created by Elzie Crisler Segar, is back alongside everyone’s favorite characters: Olive Oyl, Brutus and Wimpy. 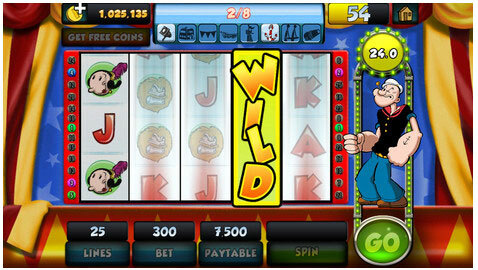 All are featured in this interactive slots game, where gamers can even challenge their family and friends! The game features ten unique slot machines, with fun themes such as the circus, medieval times, a haunted mansion and the Wild West! Players are immediately drawn into the game as they get to travel from island to island, while looking for the coveted treasure and collecting pieces to build unique ships. Gamers will also have their skills tested, as each slot machine features a bonus game, where Popeye even dresses for the occasion! Players can root for Popeye as he stares down charging bulls, sinks World War II battleships, gets shot out of a cannon, fights fire-breathing dragons and so much more! The launch of ‘Popeye Slots’ on iOS will be followed shortly by launches on Android and Facebook, so players can enjoy ‘Popeye Slots’ with their family and friends, all under the same account across all three platforms. Popeye Slots is rated 12+ by iTunes for Frequent/Intense Simulated Gambling. This game is compatible with iPhone 3GS, iPhone 4, iPhone 4S, iPhone 5, iPod touch (3rd generation), iPod touch (4th generation), iPod touch (5th generation) and iPad. Requires iOS 4.3 or later. This app is optimized for iPhone 5. 1 Comment To "Ludia and King Features Bring Popeye Slots to the App Store"